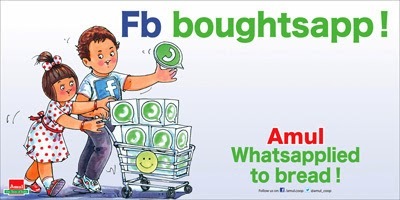 That is an interesting Ad of Amul when Facebook bought Whatsapp at whopping price !..... Amul is an Indian dairy cooperative, based at Anand in the state of Gujarat. Amul is derived from the Sanskrit word amulya, meaning invaluable ~ the Cooperative was initially, Anand Milk Federation Union Limited hence the name AMUL. It is the brand managed by Gujarat Co-operative Milk Marketing Federation Ltd which spurred India's White Revolution. Gone are the days when we ran to Bank for all our financial transactions ~ filling up a withdrawal slip for withdrawing money or depositing money into bank were challenges of yesteryears. Now we transact them online or go to ATMs - most ATMs in Chennai dispense 500s and the last 500 in 100s – there are some which dispense 1000 rupee notes. ATM called by some as ‘anytime money’ are Automated teller machines (also known as Cashpoint – a trade mark of Lloyds TSB) are man-free interaction points through devices from which people can access their bank accounts and withdraw or depositcash. From the traditional withdrawal from Bank standing in queue filling challans and always appearing bemused, automated teller machines (ATM) have changed the way of money transaction. All and sundry now flaunt no. of cards and allowing withdrawal from ATM of any bank has just added to the confusion. I fail to understand why people should queue before ATM and how do people get change of small denominations for their daily needs ? Moving away, ATMs are not exclusive to Banking and dispensation of money ! – they also vend other products such as magazines, chocolates and soft drinks. Amul has gone a step further: it will now sell milk through “Any Time Milk” vending machines. The pilot project of this 24x7 ATM began with the installation of a vending machine at the gate of Amul Dairy in Anand town of Gujarat last month. “To start with, we plan to set up these ATMs at each of the 1,100 ‘mandalis’ (village-level milk collection centres) in Kheda and Anand districts where we market Amul, Ramsinh Parmar, Chairman of Amul Diary was quoted as saying. For Rs.10/-currency note, which this machine will read through a sensor, the ATM would dispense a 300 ml pouch of Amul Taaza milk. The ATM, fitted with refrigeration facility, has a capacity to hold 150 pouches at a time. … so, it would continue to be ATM (any time milk – this time) – which will take care of the demand of the white commodity at odd hours. Officials said an ATM was installed outside its factory on an experimental basis. They pointed out that 650-700 pouches could be dispensed in a day. However, the maximum utilisation of the ATMs would happen at night. Automated milk vending machines are not totally new…. Remember that in many places in Chennai – Aavin had the facility of automated milk vending machines, where one needed to buy plastic tokens and when placed inside the machine, milk in prescribed quantity [1/2; 1 litre] used to flow… that was unpacked pasteurized milk and now Amul vends them in sachets. A couple of years back, Gitanjali Gems, the world’s largest integrated-branded diamond jewellery manufacturer and retailer, introduced gold, silver and diamond sales through vending machines. The first machine of its planned network of vending machines was reportedly launched in Phoenix Mills at Lower Parel, Mumbai. Again the precedence of gold vending ATMs were the ones at Airport in Frankfurt and a luxury hotel in Abu Dhabi where Vending machine gives you shining gold. It is not only shining luster looking machines ; they give out gold in the form of 1 gram, 5 gram, 10 gram and 1 ounce bars, and also Krugerrand, Kangaroo and Maple Leaf gold coins. The bars and coins come in snazzy presentation cases but even so, they're said to cost about 20 percent less than what a German bank or other financial institution would charge.